Apart from the regular dog's hydrobath while you wait, we also offer a drop-off-and-wash hydrobath service at Karrinyup Small Animal Hospital. The water is heated to optimum temperature and with the water recycle option, your dog can enjoy a long bath without fear of wasting water. 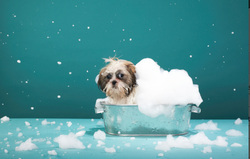 We cater for sensitive-skinned dogs by using special shampoos and conditioners with each bath.